"A really nice hole, allowing the player to 'open up' and unleash a drive into the generous fairway. 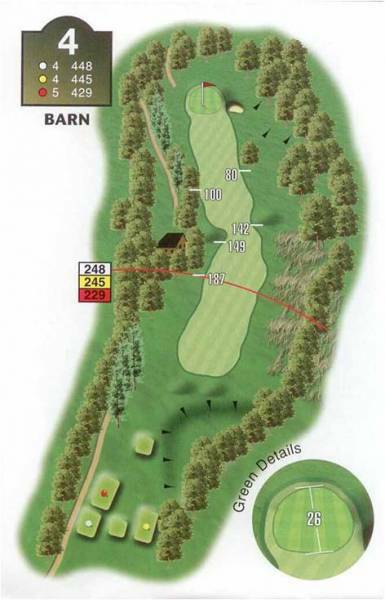 Drive the ball down the left and you must negotiate the remains of a barn where legend would have us believe many a player has carried, leaving a mere pitch shot to the green. "The furrowed fairway delivers a variety of second shots into a friendly green. Deep grass and a shallow bunker protect the right-hand side; however, this is not the line to approach. The left offers friendly contours guiding the ball onto a relatively flat green."